Intruders have broken into the office of Zimbabwe's vice president - considered President Robert Mugabe's heir apparent - through the ceiling. Debris from Emmerson Mnangagwa's office ceiling was shown on state TV along with tears to his leather sofa. There was no sign of damage to the door. The police are investigating, State Security Minister Kembo Mohadi said. 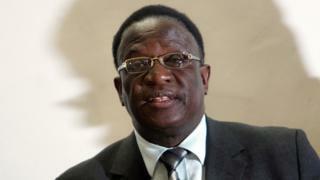 Factions in the governing Zanu-PF party disagree over who should succeed the president. who turns 92 in February. Celebrations for Mr Mugabe's birthday are to be held in the south-eastern Masvingo province for the first time, local media reported. Mr Mugabe is currently on holiday with his family in east Asia, his office said.